Well, hello there! I’ve been on hiatus for awhile, which happens from time to time, but I always come back to blog when inspiration strikes. 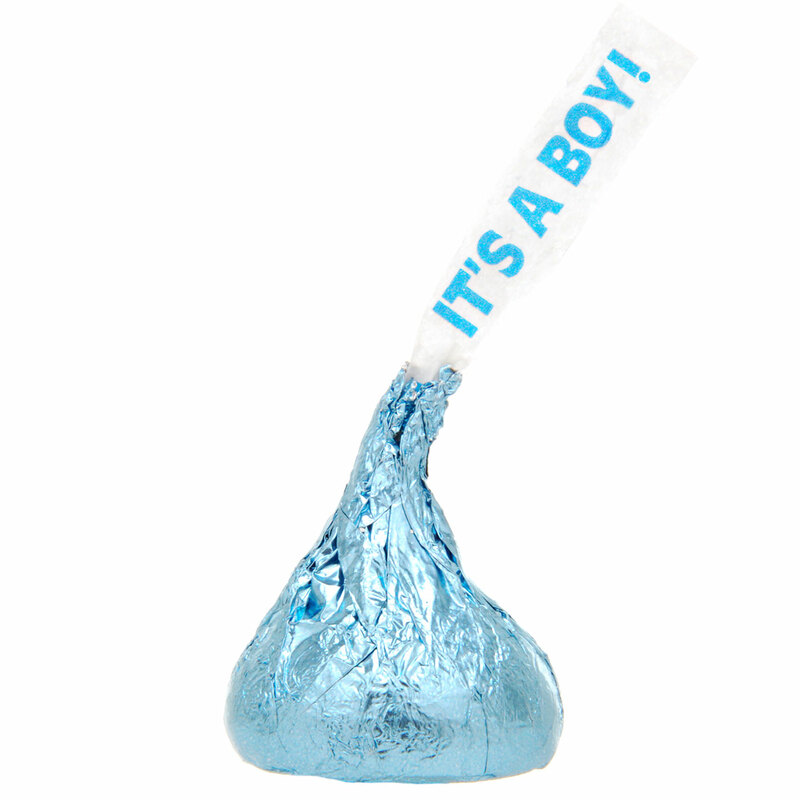 I held back on the big fanfare this time around, but I am, of course, very excited to welcome our second little guy into the world (perhaps in June, but more likely in early July), and our family’s home. It has been awhile since I worked on a nursery – they really are among my favorite rooms to decorate. They can also be among the most challenging, especially if you, like me, have a decorating style that leans more traditional than modern. Since the crib is often the focal point of a baby’s room, let’s focus our attention here. Fans of traditional style typically love using one-of-a-kind antique pieces in their decorating schemes – however, period pieces are NOT advisable when what you need a safe place for your little one to sleep! 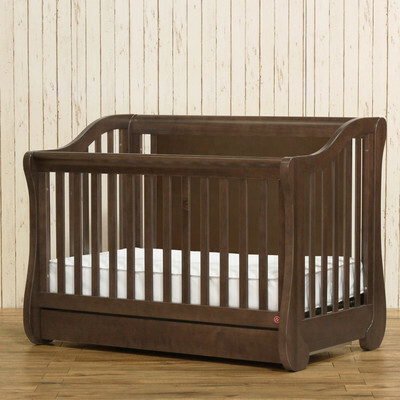 It takes some time and patience to find them, but there are some wonderful cribs available, in every price range, now that are either inspired by, or directly modeled after traditional furniture designs. Here were a few that stood out during my most recent search. Ah, yes. The quintessential Jenny Lind-style crib has endured for decades – and for good reason. It is inherently simple in its form, yet so interesting and juvenile-appropriate with its tiny turned spindles. DaVinci’s version is my favorite among current interpretations for a few reasons – it has the most classic styling, it is very friendly on the wallet (currently under $200 on Amazon! ), and comes in both stained wood and painted finishes. I especially liked the black painted option – great for boys – as well as the turquoise color shown above. Another great feature are the casters, which make it a cinch to wheel the crib from one room to the next. And if you don’t need or want the mobility – just leave them off when assembling. This is the actual crib we bought – the Mayfair 4-in-1 from Franklin & Ben (how American and traditional does that sound, by the way?). And what’s the fourth ‘thing’ that sets this one apart from the others? Well, in addition to converting to a toddler bed and full-sized bed (like many, even most, do these days), it also has a handy drawer on the bottom to store blankets, sheets – whatever you’ve got. The Mayfair is an abstraction of American Empire-style storage piece (like a chest of drawers), and will help to bridge the other antique and more current pieces I am bringing into the mix. What I especially love about the Empire style are its hulking curves – these are not the dainty French flourishes of Rococo, but rather their masculine, American counterpoint. 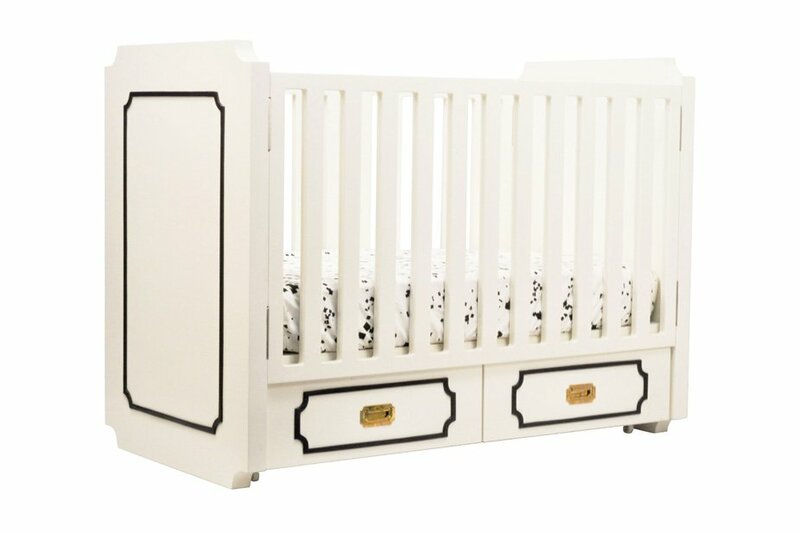 I’ve found it difficult to find a boy-appropriate crib that is not a simple, straight-lined box – the Mayfair solves this problem rather nicely. I can’t wait to show it to you in situ later in the spring! Oh, and the price – it’s a ‘tweener…will set you back about $450, which I think is a great value. 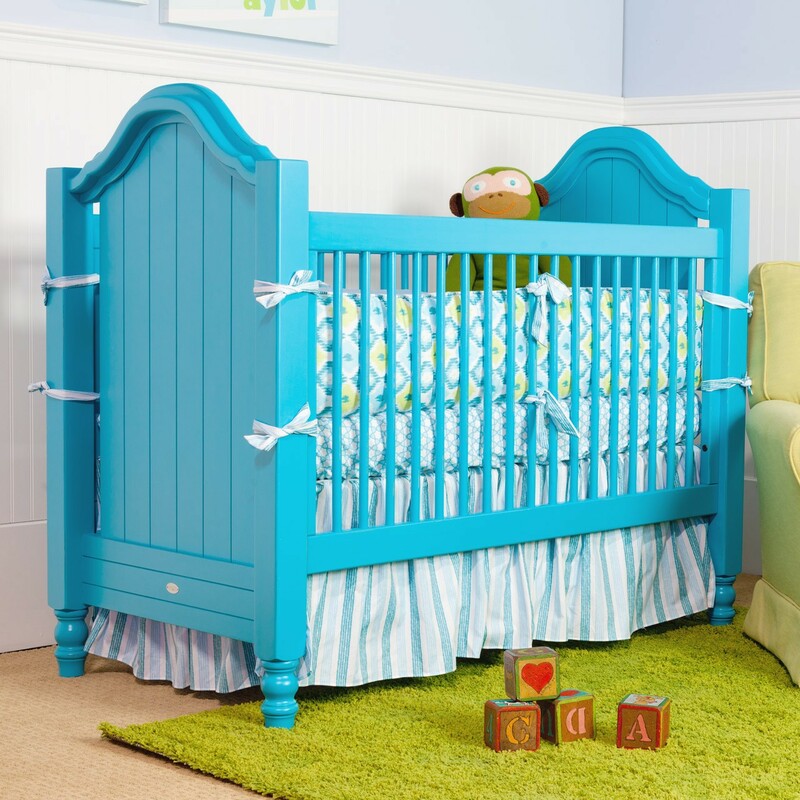 The Millbrook is a no-frills-and-flourishes crib from RH Baby & Child. Another great baby boy option (though it also comes in a lovely distressed cream finish), this black iron piece makes a statement of contrast in a neutral or light-toned nursery, and even leans a bit industrial. I happen to love many of RH’s case pieces, though I would caution against overdoing it at this store – unless you want the nursery to look like a page ripped out of their catalog. And if you do, then you’ll be thrilled with all of the coordinating items they have to offer. 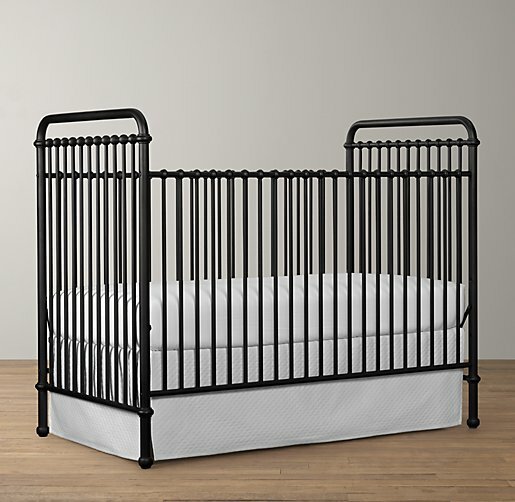 At $849, it is no steal, but I’ve got to believe an iron crib will stand the test of time, resist wear and tear, and potentially survive and sleep multiple children (not simultaneously!) in your family. No traditional crib list would be complete without a cottage-style option – and this one is a stunner. The Cape Cod crib with breadboard side panels is a furniture piece of the utmost quality, and is priced accordingly (list is $1,395!). It is “bench made” – which means by humans, by hand, right down to the turned legs – and while you pay for that, you also usually get what you pay for. Which in this case is one fine looking and sturdy (100% hardwood) crib. Not only is it well made, but it also comes in an astounding 30 wood stains and paint colors (even including many bright, saturated hues like the electric blue version shown here). This one showcases a crib skirt rather nicely, as well. 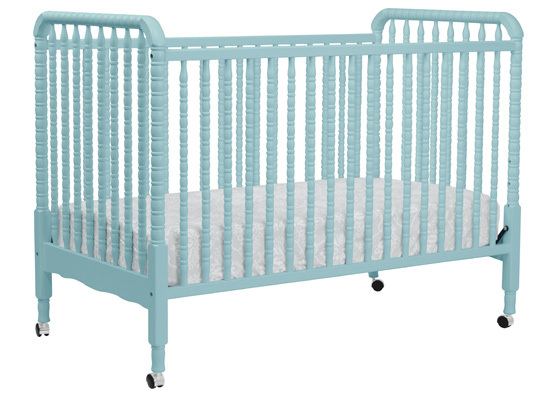 As some of you are aware, I try not to show images of cribs with bumpers on this blog, as they are not recommended for infants, but this time, as is often the case, product photography choices were limited. If the Uptown crib looks familiar, it’s because it has gotten pretty heavy play on design blogs, at show houses, and even in shelter magazines since it launched a couple of years ago. 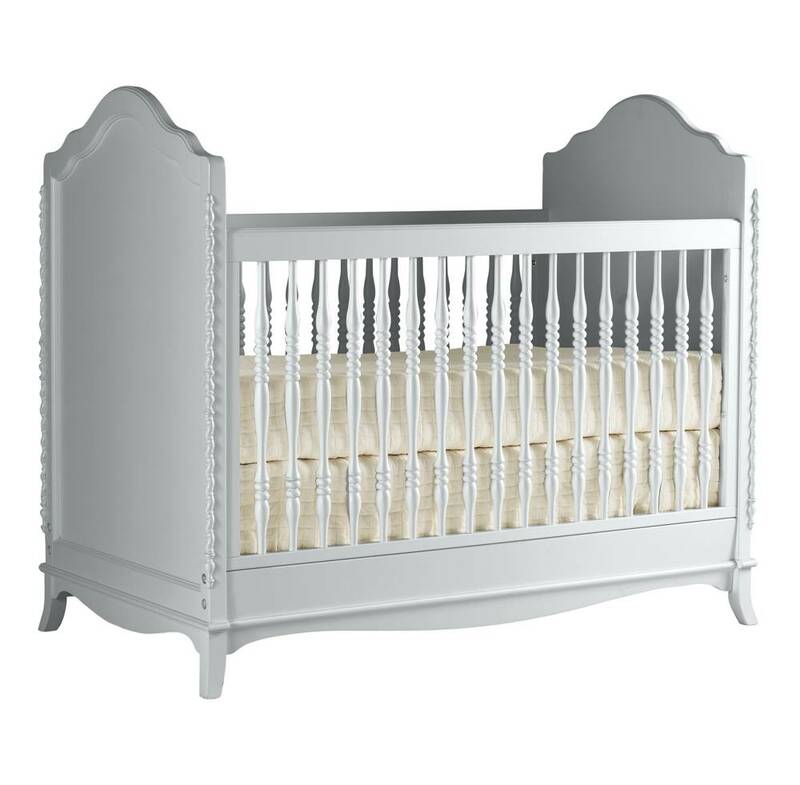 Nurseryworks states on their website that the design was inspired by British Regency, but in my book, this crib is all Hollywood Regency. The Uptown’s contrasting panel outline detail, and campaign-style hardware lend it a very grown-up, yet somewhat understated panache. It would work great in traditional and transitional nurseries – even modern rooms. Here, again, I feel that this style is inherently feminine and better suited for girls, but I’ll bet the black lacquer with white moulding finish option would beg to differ with me :). If you love this look (and the deep drawer storage it provides! ), you’ll have to be willing to pay for it. At $1,499, the Uptown is the priciest crib among my top picks. Those are my picks – do you have a favorite? 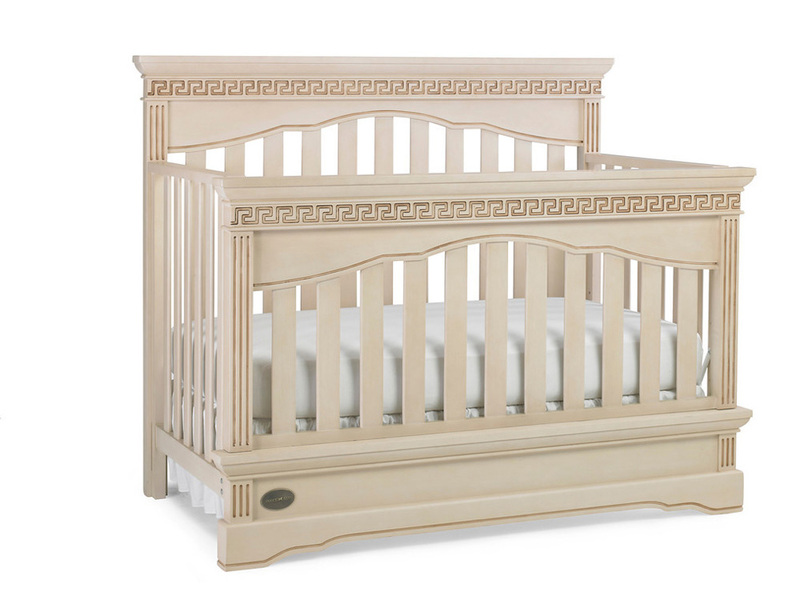 What crib(s) have you used, or do you plan to use for your babes? Need help designing a nursery, “big kid” bedroom, or play space in your home? Please contact me, let’s talk!